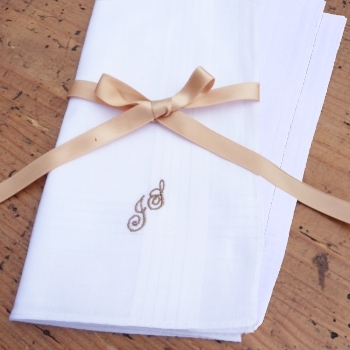 You get three standard white cotton mens handkerchiefs you can choose to have them personalised with initials or a name. Just fill in the option box and choose what colour embroidery thread you would like us to use. 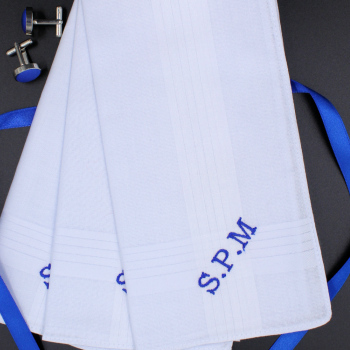 You get three standard white cotton mens handkerchiefs you can choose to have them personalised with initials or a name. Just fill in the option box and choose what colour embroidery thread you would like us to use. Make someone very happy with a unique gift dedicated to them. Please allow at least 2 days for personalised orders to be dispatched as they are made to order by Amys Gifts. As standard we ship these bundle stacked, however you may choose the additional add presentation option for this set of 3 hankies to be supplied in a black gift box.